Evernote is the name of the application. It used to add notebooks that can include an interesting variety of content. Evernote is an excellent way to create notes, define lists and group content. There are many other alternative in the market. You can store all kinds of information while retaining its original format in this notebook. Such as personal annotations fragments of web pages or blogs, email addresses, outlines, images, videos. Any other object that can copy and paste with this application. To the notes you can attach with the free version all kinds of files audio: MP3 and WAV and documents: PDF, HTML and TXT. You can also incorporate all screenshots, although Evernote offers its own captor. Today we will talk about Best Evernote Alternative Apps for Ubuntu Linux. The best alternative evernote in the Linux desktop is to install the Windows client through Wine. 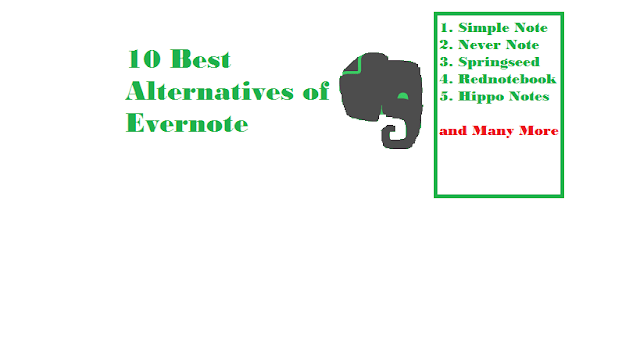 The following evernote alternative may be helpful for you. Simple note is a free and simple application as simple as its name indicates. You write down everything you want and organize it by means of categories. Use it everywhere: Your notes kept up to date on all your devices. There are no buttons to press. It just works. Stay organized: Find your notes quickly, with instant search and by means of labels. Rewind your changes: Your notes will save when you change them. You can undo the changes by dragging the slider at the top. It is free: Backup copies, synchronize everything is completely free. A free evernote replacement works in Linux perfectly. It is compatible with most features of Evernote you can drag and drop images, PDF or previews. Evernote files easily synchronized with Nevernote. Nevernote does not lose almost any feature. If we compare it with Evernote what we notice is a very big visual change. Change the background or the title of a note. Springseed is one of those elegant design alternative evernote applications. That designed exclusively for Linux. The application allows us to organize our notes in different notebooks and bet on a minimalist style. It also offers synchronization with Dropbox. It allows us to work with the application on several computers. It allows us to organize our notes in different notebooks. It is able to attach different types of files. Rednotebook is an Evernote alternative application focused on used as our personal diary. It has a calendar that gives us access to the notes. That we create every day, week, month, etc. It can work perfectly as a note manager. It counts as an advantage that in addition to text it has support for images. The possibility of exporting our notes in various formats, among which are PDF, HTML, Text or Latex. We can use tags, which can be very useful. TagSpaces not only presents itself as a complete notes editor, but also as a different way of organizing our files. We have seen it is undoubtedly the closest to a productivity suite. TagSpaces allows us to take notes, using plain text. TagSpaces offers support for formats such as ePub. It offers us the necessary tools to create our own wiki on any topic we want to investigate. It offers support for Chrome cast. It has apps for both iOS and Android and official extensions for Google Chrome and Mozilla Firefox. Hippo Notes has just launched its beta version. It remains to wait that the acceptance of the public is those who carry out this project propose new versions and improvements. Hippo Notes has an excellent synchronization with the servers of the renowned Evernote tool. This tool for Linux can read and edit the documents. Laverna is a free Evernote Alternative focused on privacy. Its function is to take notes in different operating systems for Ubuntu Linux. Laverna is an open source program and currently provided for Mac, Windows and Linux operating systems. We can synchronize between these operating systems to have the notes always at hand. The difference compared to other similar programs is that the service does not have its own servers. WizNote is the Chinese competitor for Evernote and Google Keep. The annotation service has synchronization in the cloud, user for Linux and web version. User can still create folders to organize their notes, sort them by tags and version all changes, as well as check when each made. You can at any time click on the information in a note and select the encryption. Making that note readable only after typing an offline password unlike your account password it is not stored by the application. Geeknote is an evernote replacement for the Linux terminal useful for adding notes to Evernote using Bash Shell scripts. It cannot directly use the Evernote SDK. Simply to manage your Evernote notes from the Evernote line. Geeknote supports all the basic Evernote functions. You can create and delete notes, create notepads and labels. Search notes with filters and edit existing notes. Geeknote comes with a tool called gnsync, which allows you to synchronize a directory. That contains text notes (we insist, only works with text data) with Evernote. The tool allows us to take notes, save browser favorites, store documents and photographs, share passwords with co-workers, etc. It is an open source application that encrypts all data. It is true that Evernote some time ago could be above most of its competitors. Above all, it is one of best suits you. It is what you really look for in an Evernote alternative application of this type. Evernote is a simple but at the same time very powerful computer application. It allows you to annotate save and organize all kinds of information.